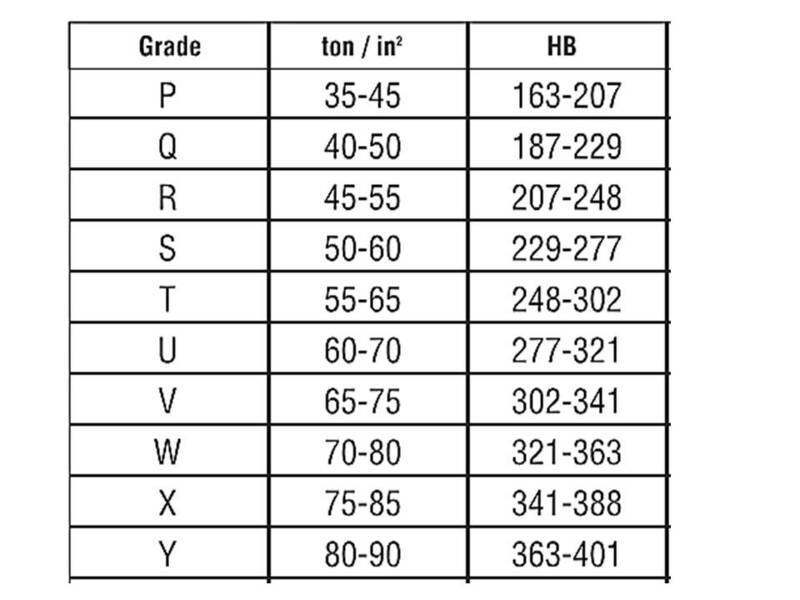 Fasteners in both Metric and Inch described by their material, and dimensional categories are also described by their strength, class and grade information, full details are shown below along with pictorial descriptions. Tensile Strength is the most widely associated threaded fastener mechanical property and is the maximum tension applied load the fastener can support before its fracture; it is also called Ultimate tensile strength UTS. Strength systems for bolts are based on levels of their ultimate tensile strength; this is when a bolt is subject to stretching along its axis and accordingly making it longer. If a small load is applied the amount of stretch is also small, and the bolt is stretching elastically; when the load is removed the bolt goes back to its original length, and the elastic limited has not been exceeded. If we increase the load to the bolt beyond its elastic limit, we will reach its yield strength, and the bolt is permanently stretched. 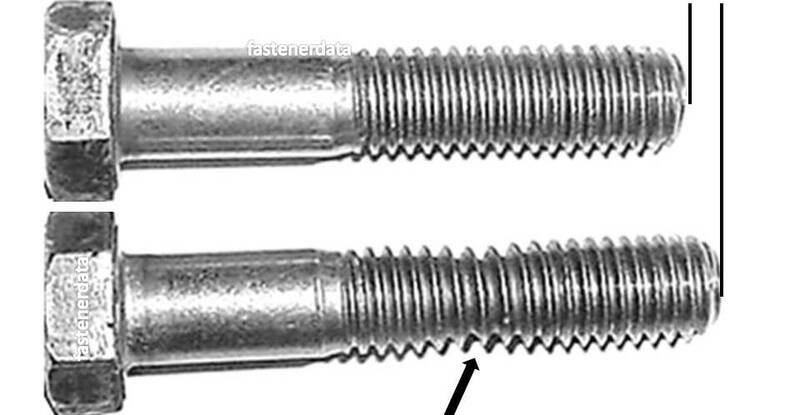 Eventually, a further increase in loading the bolt reaches its ultimate load and maximum tension, this point should not be exceeded or the fastener will develop a reduced shank called necking and will fail. The metric property classes (grades) of strength are defined by two numbers separated by a dot, where increasing numbers represents an increasing tensile strength. The number to the left of the dot indicates the ultimate tensile strength in Mpa divided by 100. Alternate systems exist for unified inch series bolts and screws in carbon and alloy steels. Bolts are typically marked on the head to show the grade of the bolt and the manufacturers identification. Commercial hexagon nuts are made to SAE J995. 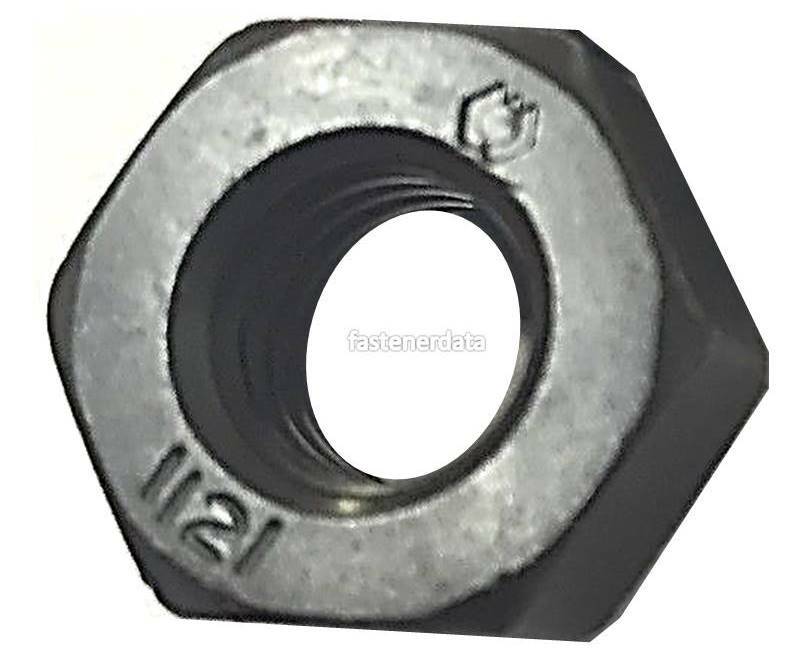 Grade A is a low tensile nut and is used with grade 2 bolts; grade B is used with a Grade 5 bolt and grade C with a Grade 5 bolt. 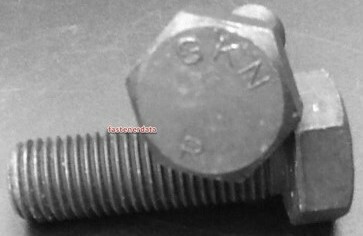 Commercial British fasteners are produced to grade 'R' for Whitworth and BSF and to grade 'S' for British Unc/Unf and the designation letter and manufacturers mark are shown on the head. Unless specified grade 'S' unified will be replaced by USA SAE grade 5, a similar grade/Property class. Commercial stainless steel bolts and fasteners are made from austenitic stainless steels that use the designation letter ‘A’. Austenitic materials are the best for corrosion resistance and extensively used in the production of stainless steel fasteners amounting to approximately 75% of all stainless steels produced. Austenitic is the metallurgical condition of these stainless alloys in that they can only be hardened by cold working, not by heat treatment. For the austenitic steels, there are three important alloy classes the most common of these is A2; if increased corrosion resistance is required the marine grade of A4 is the available commercial class. 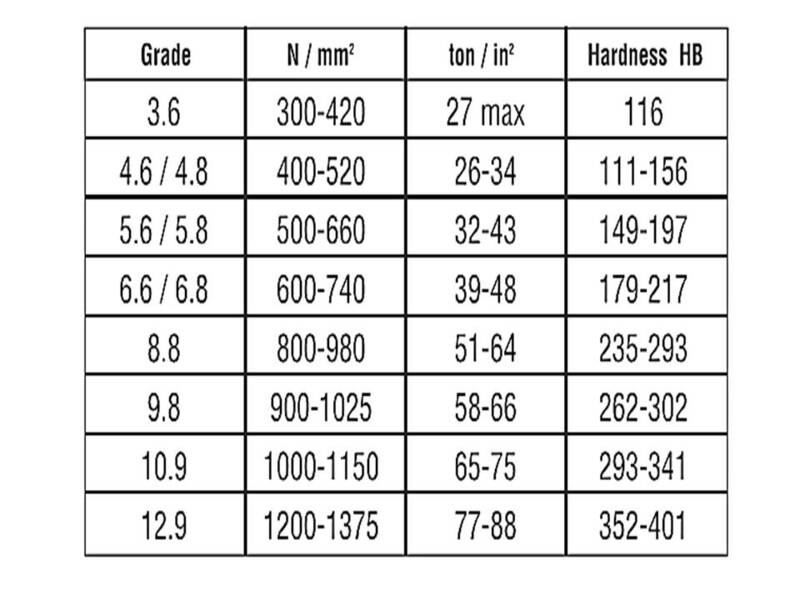 Free machining grade is designated A1 and is used in dowels, pins and other applications. The second most popular type of stainless, after Type 304, is Type 316. Fasteners in Type 316 stainless steel compared to 304 have the chromium content lowered from 18% to 16%; however, the nickel content is raised to 10% and 2% molybdenum is added to the material mix. This change in the chromium/nickel ratio and the addition of the molybdenum increases the resistance to chlorides. This is why Type 316 stainless is often used in more corrosive environments where the material will be exposed to chemical, solvent, or salt water corrosion and makes it the preferred material for marine construction.